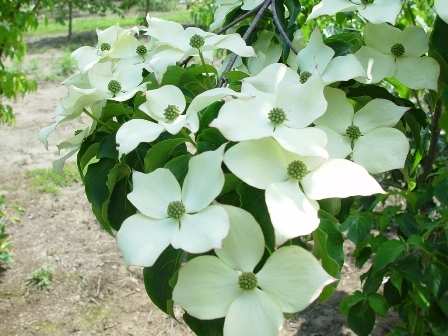 Kousa dogwood is a native of South China. 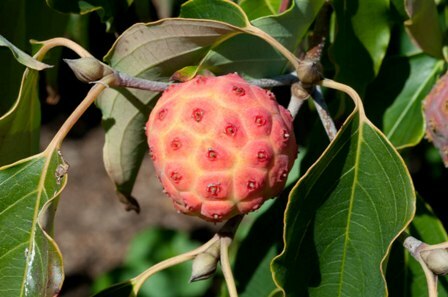 Though the fruits are edible and eaten by local people too, yet kousa dogwood is planted in gardens as an ornamentals plant. It is an extremely showy plant at the time of blooming. A small deciduous tree or a multi-stemmed shrub, with a vase-shaped habit in the early years but eventually maturing to a more rounded form, 8–12 m tall. Leaves simple, dark to medium green, 4–10 cm long, 2 – 2.5 cm wide, opposite, elliptic to ovate, acuminate leaf tufts of hairs in the vein axils and the leaf undersides. Flowers small, held upright along the stem, greenish yellow, surrounded by four large, showy pointed bracts which make the flowers attractive, individual bracts 2.5 to 5cm long and about 1.2 to 2 cm to wide. Fruits look somewhat like raspberries, pendant, dull raspberry red at maturity; very showy, 2-3 cm wide, edible, somewhat mealy. The fruits are edible. As they do not so good, so these are not popular and sometimes left for birds. 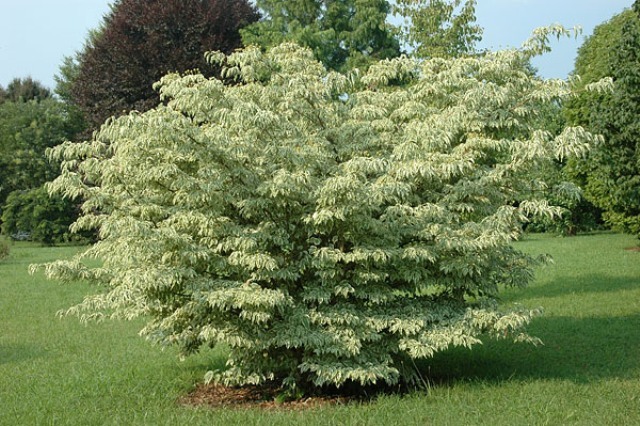 As kousa dogwood trees are very showy, especially at bloom time, so these are very commonly planted in gardens for landscaping as specimen lawn tree, patio tree or in small groups in grooves. They will grow under full sun to partial shade and seem to prefer a moist, fertile, acidic well-drained soil high in organic matter. New trees are raised from cuttings as well as seeds. After a couple of years from planting it will be better to remove some lower branches so that the bark is revealed. 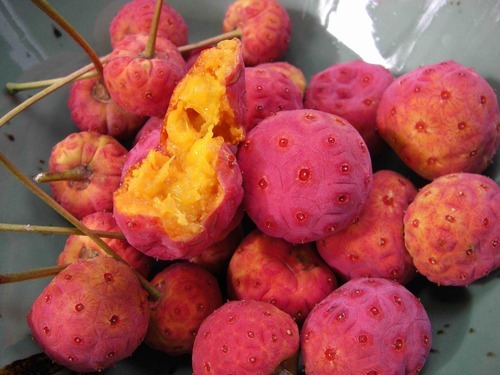 Some varieties of this fruit are also sold by nurseries.